Lurking Rhythmically: Feng Shui: Dodging - Ponies. Pistols. Prepping. This past Saturday was the end of our Feng Shui adventure arc, and while this isn't my last foray into the realms of Hong Kong-style action RPGing, I'm ready to get back to Traveller for a while. That said, I'm not done talking about Feng Shui. During the last fight of the story arc, the players were fighting a big bad boss supported by many mooks in a defensive posture. The players spent a lot of time dodging incoming gunfire by said mooks, and I'm not certain if I handled it the best way. 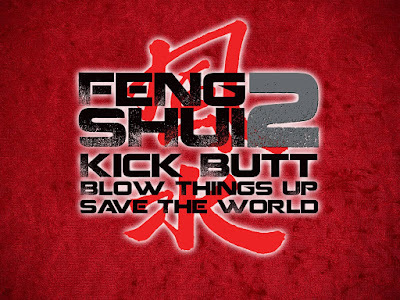 In Feng Shui's rules as written, you declare a dodge after the GM says someone is attacking you but before the roll is made and the result announced. Now maybe I'm a big ol' softie, but I thought it was cinematic to allow the PCs to go "Oh crap!" and abort to a dodge after the roll is made but before the result is announced. I figured that losing shots (and potentially burning Fortune) was penalty enough in an action game -- after all, if you're dodging you're not fighting, and Fortune is a limited resource. GM: Two of the mooks hit. A simple dodge will work for one, but you'll need to dodge and spend Fortune to avoid the other. Will you? Player: Huh? Sorry, I wasn't listening. GM: Will you please spend Fortune on that? With 6 players and 30 or so mooks, this can happen many times in a game session. I'm not yet ready to do away with the "abort to a dodge" house rule, because I understand that bosses hit hard and players don't want their characters hit -- but I'm currently giving it the gimlet eye and sizing up its neck while I sharpen the butcher knife. But what I think I will do is remove the ability to abort to a dodge against mooks. I realize that they are designed to be speedbumps, but they need to be some kind of a threat and they seem to work best in groups. So perhaps I will rule that when fighting mooks, you either take your lumps if they hit or you just do a blanket "I dodge" and... hmm. That still ends up with having to roll fortune and a game slowdown. GM: The mooks shoot at you as you run through their killzone, automatic rifles blazing. GM: [consults pre-rolled Mook AV chart] Okay, you're down five shots and three Fortune. Player: Um, I only have two Fortune. GM: No, what you mean to say is that you have zero fortune and a gunshot wound. Yes, I like this concept. Let's see how it plays out the next time I break out the Feng Shui rules.